In heavy 1-quart saucepan, heat 1/3 cup butter over medium heat, moving and turning pan occasionally, just until butter is light brown. (Watch carefully; butter can brown and then burn quickly.) Cool 15 minutes. Heat oven to 350°F (325°F for dark or nonstick pan). Grease bottom only of 13x9-inch pan. In large bowl, beat browned butter, cake mix, water and eggs with electric mixer on low speed 30 seconds, then on medium speed 2 minutes, scraping bowl occasionally. Pour into pan. Bake and cool as directed on box for 13x9-inch pan. Spread jam evenly over top of cake. Freeze at least 15 minutes or until jam is set. Meanwhile, in 2-quart saucepan, melt 1/2 cup butter over medium heat. Stir in brown sugar. Heat to boiling, stirring constantly; reduce heat to low. Boil and stir 2 minutes; remove from heat. Stir in milk. Heat to boiling over medium heat, stirring constantly. Cool to lukewarm, about 20 minutes. Gradually stir powdered sugar into brown sugar mixture. If frosting becomes too stiff, stir in additional milk, 1 teaspoon at a time, or heat over low heat, stirring constantly. Spread frosting over jam. Store loosely covered. So the jam will spread easily, stir it before spreading it on the cake. In a rush? 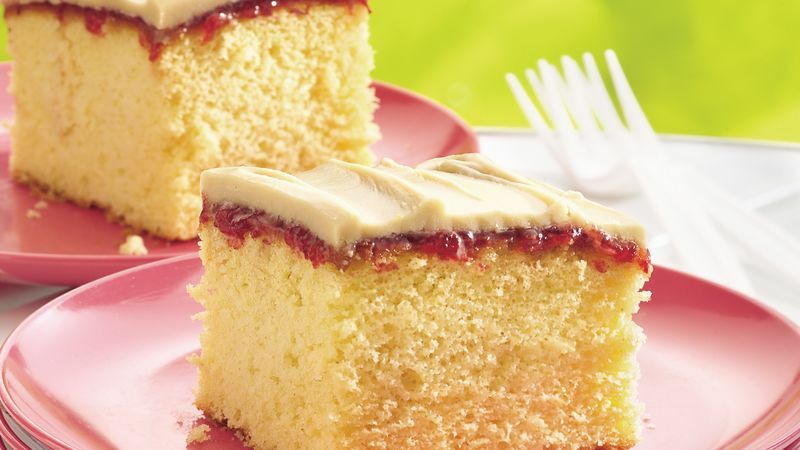 Use 1 container (1 lb) Betty Crocker® Rich & Creamy vanilla frosting instead of the Brown Sugar Frosting.